7.86 points at 43 votes (rank 115). You should be careful when crossing trap doors and energy barriers, as we have already lost some potential customers. Behind that is – by the way – the mummy room. At the last visit the mummies were still well wrapped, but the last two weeks nobody was with them. You might want to enter yourself? You ask if there are also bedrooms? In this house there is something sleeping in every room, but most of the time it does never wake up again. Most of the time! And the neighbours? Well, the vampires the hills away always like popping in for a small snack and Frankensteins next door have just finished a new monster, which went a bit aggressive though. It likes hanging around in foreign houses and hides in coffins which are standing around. So, I believe I must let you alone a bit so you can collect everlasting impressions. If you want to let yourself out: somewhere in here there must be the key for the front door, you just have to find it. The way out is probably easy to find and if not, just stay a while. Dr. Creep will be back soon and is glad about everyone who helps him with his experiments. Goodbye and good luck! This leaves me to say: never trust a Transylvanian estate agent. But now you are stuck in one of the thirteen castles of Dr. Creep. To get out of here is not easy. These teem with electric traps, Frankensteins and mummies, that let the escape seem a hopeless undertaking. You can manage the flight anyway, if you solve the logic problems that are associated with it. Every castle consists of a certain number of rooms that are connected to each other by exits. Every room represents a screen and contains plenty of dangers, as the agent already mentioned. By tumbler switches or sensor contacts almost all of them can be switched off. The problem is, that you have to enter some rooms several times and keep a certain order, logical thinking is a basic premise. From the fourth castle the puzzle will get very complex. For beginners some especially easy castles were programmed. You can also choose the option for unlimited lives, with which you will lose the claim for a place in the highscore list. Next to the tutorial, where you can practice fighting with all enemies and adversities, there are 13 castles that can be chosen over the menu. If you add the rooms of all castles this makes 200 rooms. 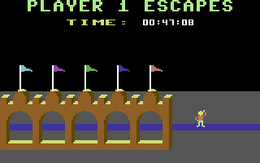 The score can be saved and also the minimum time for leaving every castle is saved. The game is not as scary as it might look after reading the initial description. The graphic is kept a bit abstract but clear and monsters such as mummies animate more to smirk than to scare. As background tune there is lots of music from dark hours of famous classics. A nice tricky puzzle-platformer for one or two players playing with or against each other. After loading the demo mode will start after a short time. In the second run also the background music starts. To start the tutorial (the learning level) press the fire button in the demo mode. 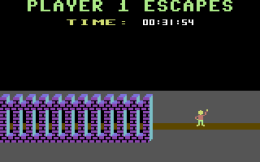 Now you find yourself in the map mode (the overview map of the castle is shown). Press the fire button again to enter the first room of the tutorial. Then follow the examples that are shown to get a first impression. After you have played through the tutorial and your time is low enough for the top ten (highscore list) you will asked to enter your initials (3 characters). Then you press the "Return" key to go to the demo mode. Press the key "Run/Stop" in the demo mode (Esc key with the emulator) to get to the menu screen. Here you see the names of the 14 castles (incl. tutorial), arranged from easiest to hardest castle. By pressing joystick forward/backward you can place the cursor ( > )in front of the desired castle name, to confirm press the fire button. The loading of the castle is done, when the white bar is over the castle name. Now move the cursor to the menu item "EXIT MENU" and press the fire button. You then get to the demo mode. With fire button you now start the selected castle. If you lose a life you are set back to the starting point but everything else in the castle stays (nothing is reset to the state when starting the level). If you play with a partner he will stay where he was when you lost your life, you need to go back to him to continue playing the game in two. Before you start with the first room and after leaving a room this map is shown. It shows all rooms that you have entered until now and the one that you will enter next. 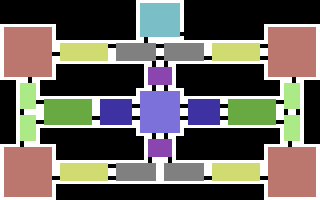 The black gaps in the white borders show the connections between the rooms. 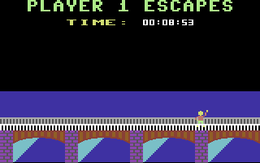 In the upper part the time needed until now and the current player(s) (One up) is shown. The position of every player is shown on the map by arrows. 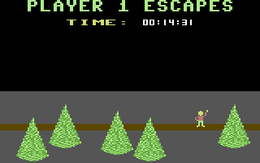 In the two player mode there are two arrows. The arrow of player 1 flashes fast while the arrow of player 2 flashes slowly. While the map is shown the time in the game doesn’t run. To leave the map and get into the next room press the fire button. Each of the rooms of the 13 castles is unique, but parts of the furnishing are similar. The following tips will help you on your way through the castles. Colour-coded runways: In every room there is at least one way. The colour corresponds with the colour that the room is shown in on the map. You can also see the colour of the way of the adjoining room when the exit is open. The colour code will help you to orientate when you move through the castle. Exits: Every room has one or more exits. 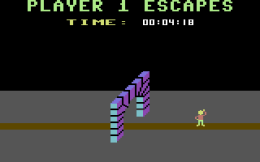 Exits that connect two rooms are bordered with violet bricks. Some of them are locked with white grates, while other are open. To leave a room through an open exit, stand in front of it and press the joystick right-forwards. Door bell: Next to some exits there is a door bell. This is depicted by a white round knob inside a circle. To push a door bell and with this open an exit, stand in front of it and press the fire button. Lock and key: Some exits have a lock. Controls are done same as with the door bells, but you need to have the keys of the same colour as the lock to open the exit. Keys are scattered around in the rooms of the castle. To pick up a key stand in front of it and press the fire button. Only the player that picks it up can also use it. Players cannot pass on the keys or swap them. Locked exits without lock or door bell: These can only be opened from the other side. Ladders and poles. Use them to get from one platform to the next in a room. You can climb up and down ladders but only down on poles. Everywhere in the castle there are obstacles and creatures that can mean a fast end for an inexperienced future castle tenant. With fantasy and intelligence you can play them off against each other. Lightning Machines are silver balls that hang from cylindrical frames. When these are switch on you should not use the way below it, as the flashes are deadly. The Lightning Machines are controlled by yellow-white switches. To use a switch, stand in front of it and move joystick forward/backward. Force Fields are glimmering walls that block some ways. They cannot hurt you but avoid to get into a dead end behind a force field. The hexagonal red-white button allows you to switch off the force field for a short time. Stand in front of it and press the fire button. The white part of the button disappears and the force field is switched off. During the next 8 seconds the white part of the button reappears. When the button is full again the force field reappears. Mummies move slower than you and they cannot use ladders or poles, but if you touch one you will lose a life. If you touch a blue Ankh for the first time the corresponding mummy will come out of its stone tomb. You can snuff out a mummy by luring them under a Lightning Machine, let it get shot by a Ray-Gun or open a trap door below its feet. Ray-Guns move slowly up and down their spur racks. They try to get into one line with you and then shoot at you. The control switch of a Ray-Gun looks like two arrows and below a white button. By standing in front of a control switch you can steer the position of a Ray-Gun on the spur rack and by pressing fire release a shot. Matter-Transmitter are white booths above the way. Receptors are coloured circles above the way. To operate a transmitter stand inside the booth and press the joystick forwards until the inner colour of the transmitter corresponds the colour of the desired receptor. After pressing the fire button you will be transported to the corresponding receptor. Trap doors work with proximity switches. These switches look like a white line with an upper and lower dot (red/white). As soon as a player, a mummy or a Frankenstein passed a switch the corresponding trapdoor will be opened or closed. Every creature that is standing directly on a trap door when it opens will be killed. An open trap door serves as barrier. Moving Sidewalks are operated by a white button with left and right lying arrows. Stand in front of the button and press the fire button to switch a sidewalk on and off. when the title screen is shown or in the demo mode, you will reach the menu. 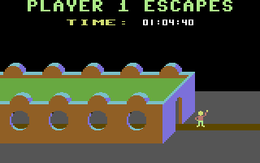 during the "map mode" (while the map of the castle is shown) you get the option to save the score. 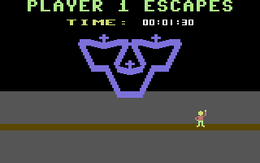 A saved score can be loaded over the menu. inside the game it starts the pause mode. inside the game you can make a "suicide" of the players with this key, e.g. when you are at a dead end. The players are placed into the starting room, the castle will not be changed. when the key is press while you are in the "map mode" the game will be ended and you get back to the "demo mode". You have not chosen the option "unlimited lives" in the menu. You have not saved and reloaded the score. The time in which you have solved the castle must be under the best ten. You are asked to enter your initials (3 characters). The programme saves the highscore on the game disk, which must not be write-protected. The list can be viewed by choosing the menu item "view best times" in the menu and pressing the fire button. After the start wait a while and view the demo. Here the basic items and their operation are explained. Play the tutorial as the first castle. It is pre-selected after the first selection of the menu (Run/Stop key in the demo). Here the traps, monster etc. are introduced and you can practice the controls. Play in pairs. In this mode the game is much simple but also more amusing. This very good cooperative mode promises a fast sense of achievement. Without maps of the castles the game gets rather hard. On the website "Doctor Creep Real Estate" (see section "Links") you will find them. Here you also find the longplays of all castles as "Vice history files" for the emulator VICE. Also look at the video in the section "Video". Here you can see very well how a castle is solved in the 2-player mode. 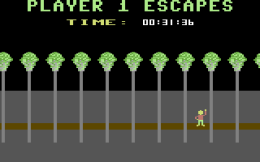 You can get the solution of the castles "Tannenbaum" and "Callanwolde" as video download at Archive.org (C64 Gamevideoarchive), see section "videos" below "Links". Jammet: "Voter 3+(satisfying plus) if you count in the frugal graphics and the sound/music. The gameplay itself would deserve a „good“ with 2 players because it is innovative – even though sometimes rather frustrating." Sledgie: "This game has a special charm. When playing in pairs a good cooperation is necessary. The difficulty is depending on the castle from simple to absolutely hard and with this the game is suitable for beginners to "fans"." Robotron2084:"Two-fisted, satanically mean and unfortunately also very repetitive, sometimes unfair and cursed with a notch control. However, with its clear graphics, the affectionate background sound (classic, what else?) and the extremely dodgy level design a real highlight. In pairs it is only half as difficult or respectively exhausting, as you can share the work. I hardly know any game where you are at your team-mates mercy to such an extent as here. And also hardly one where you can freak out that much. To kill your team-mate shortly before reaching the exit of one of the really hard castles - which of course is totally unproblematic - verges on psychic cruelty. So nothing for choleric persons. 8 out of 10 points, a great puzzle classic!" The Heist: "If I remember right the game had a rather long loading time, until you came to the castle and could shake a leg. The game could convince by the 2-player mode, which in that shape has not existed before, as you did not have to compete against each other but find a solution together. The title also still today speaks volumes ;-)"
Digisequencer: "An absolute ingenious game! 10 out of 10 points from me. It is especially attractive that you do not only have to have an eye on the current room but also take care that you don’t accidentally block the further way by e.g. not switching a Lightning Machine from up to down or something similar. Also very nice is that not all the levels are build the same way, so you didn’t know whether to first work the left side of the first room or rather go up or so. But especially successful is the possibility to play in pairs in a team – not against each other or one after the other as in other games. In some levels it is just more fun, in others you really save a lot of time in the 2-player mode. I thought the music lovely, I think as a kid this was my first contact with classic music and this first song that is loaded in Creep just got a catchy song for me. In the end one needs to mention that the intermediate screen that showed the map from above when you left a room gave you the possibility to make a pause without the time being measured." 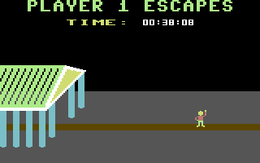 Flodder: "My absolute favourite game on the C64. There was never again such an intelligent platformer with such tricky puzzles, mean traps and scary enemies. It is the two player mode which is a great pleasure, but alone it is an illegal case of slave labour. The addictive factor is enormous, you do not want to stop until you have explored all the castles to the end. A very nice feature is the possibility to set the number of lives to unlimited without a cheat - in return there is no entry into the highscore list for punishment. There is only one vote here: 10 of 10." 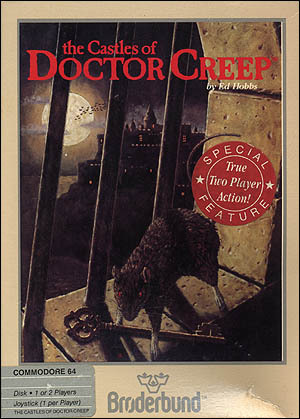 There was an "Editor of Doctor Creep" which was written by a fan after he had played through all castles. Unfortunately, it got lost and cannot be downloaded anywhere as far as it is known. 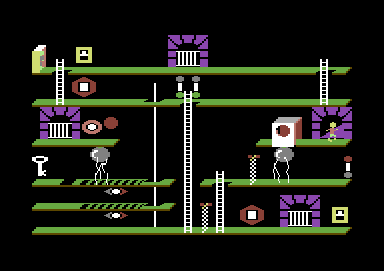 But the corresponding fan plans to write a new version, as soon as he is up to date again with the C64 assembler. This page was last modified on 31 December 2018, at 03:38.